An only child whose aristocratic parents were first cousins, Vita Sackville-West was raised in wealth and privilege in an enormous country house that she knew from an early age she could never inherit because she was born female. In this highly entertaining new biography, Matthew Dennison sketches the “parental absenteeism, maternal whim, and . . . extraordinary surroundings” that constitute a childhood nearly engineered to produce a writer as unconventional as Vita became. Attracted from an early age to romantic, “swashbuckling” adventure tales, Vita matured into a woman uncomfortable with the roles Edwardian society expected of her but perfectly happy to invent new roles, identities, and costumes of her own. Now remembered mostly as having been a lover of Virginia Woolf’s, Vita was in her lifetime a best-selling author of poetry and prose. She also landed at the center of a number of scandals, all of which Dennison describes with both sensitivity and wry humor — at times, her romantic complications became truly farcical. Plagued always by a sense of her own duality — female or male, “propriety pitched against protest, conformity against self” — Vita seems lucky to have married Harold Nicholson: bisexual, brilliant, and devoted to her. The couple had two sons and by all accounts a sustaining if unusual marriage. Given the amount of energy Vita devoted to her writing and her lovers, the time and attention she could devote to Harold and the boys “was boundless in theory but circumscribed in practice.” One wonders how differently Vita’s life might have unfolded in a more modern time; still, Dennison’s book inspires not pity but a kind of delight. Boethius, a sixth-century Roman, while on death row for treason, wrote a treatise that later came to be known as “The Consolation of Philosophy” in which Philosophy (in the guise of a woman) enters his cell at night to talk to him about his errors and instruct him in the proper way to live. Like it or not, this ancient text is clearly the starting point of the modern self-help movement. In a wide-ranging book that straddles self-help and philosophy, Jesse Browner quotes Boethius (along with Robert Frost, Franz Kafka, Rollo May, and of course the Talking Heads) on the immortal topic: How do we make peace with our own lives? Browner, a novelist and family man, remains haunted by his decision to abandon bohemia — “I made the decision to opt for love and tranquility,” he writes of his choice to marry and take a day job. How can we make sense of the lives we actually lead when all those untraveled paths still bother our dreams, Browner wonders? Although Browner’s admitted “strain of self-pity” can grate at times, in the end it’s a useful question: What becomes of the road not taken, and when is it time to stop gazing down it? 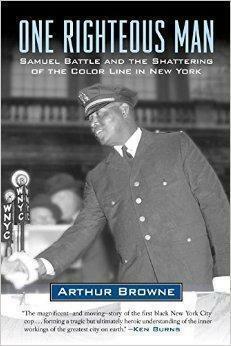 Arthur Browne, a New York-based journalist, writes movingly of Battle’s fight not only to enter the NYPD but to succeed within it. A North Carolina native, Battle’s story encompasses the Harlem Renaissance, the integration of the New York Fire Department, and the start-and-stop gains in civil rights in the North. Toward the end of his life, Battle enlisted Langston Hughes to help him assemble his autobiography, but no publisher would take it on (even with a foreword penned by Eleanor Roosevelt). Although Battle died in 1966 without having seen his story published, it’s impossible not to feel how much he would have appreciated Brown’s work, which wraps the man’s own words in a reporter’s thorough, lively accounting of a life well lived. Most high school romantic comedies are immediately forgettable; at best, they appeal to our nostalgia with a few great lines and a killer soundtrack (“Sixteen Candles” was it for my era). But according to Jen Chaney, 1995’s “Clueless” transcends its genre and even its era. A slant adaptation of Jane Austen’s “Emma,” “Clueless” featured strong female characters, a witty look at social mores, and a stunning visual and fashion vocabulary that still feels relevant today. Chaney, an entertainment reporter, seems to have gotten just about everyone involved in “Clueless” to talk to her abut the making of the movie, from writer/director Amy Heckerling’s endless attempts to get the project funded to casting (what if Paul Rudd’s role had gone to Ben Affleck?) to editing and premiere. No scandals emerge, and the book can feel a bit fluffy, but the behind-the-scenes memories will thrill those who loved the movie, and Chaney makes a good case for its enduring influence.